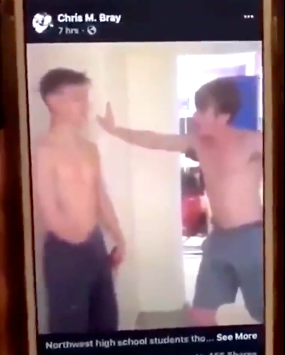 A high school in North Carolina is in hot water after two of its students were featured in a viral video on social media using a host of profanities and racial slurs and even referencing the lynching of black people. Now, administrators from Guilford County Schools are reassuring parents of their commitment to diversity and inclusion, although the man who initially shared the video says that the school isn’t doing enough. The video in question features two white male minors saying things like “lynch them all” and “put them b****es back in the field” while also using the n-word repeatedly. When Bray posted it to his Facebook page to spread awareness, it was removed by Facebook three times. Still, it was viewed more than 44,000 times and shared by 1,000 people before some started to capture screen recordings of the video to post on their own platforms. That included a Twitter user named Adriahna, who called on Northwest Guilford High School and the school district to do something about it. The administrator also assures that “the students involved were disciplined in accordance with our student code of conduct,” although further details could not be disclosed by law. Still, Bray says that students who have been in contact with him are telling him otherwise. While the NCCJ has not yet responded to Yahoo Lifestyle’s request for comment, Bray again says that students have not yet been exposed to any of the training they were allegedly supposed to be getting. Instead, students have expressed that it’s being brushed off yet again. 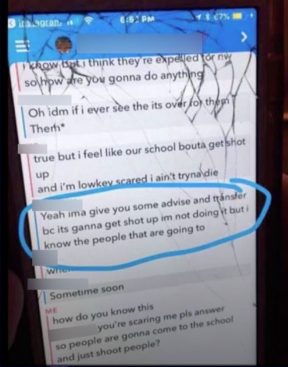 As of Tuesday night, the situation only seemed to be getting worse; Bray’s sister received a Snapchat message regarding the threat of a school shooting. The Guilford County Sheriff’s Office told WFMY2 News that there would be increased security on campus Wednesday morning because of the threat. Among all of the destructive behavior to come from the viral video, the local news station also shed light on one student who is actively trying to bring students together with sticky notes throughout the hallways that share positive affirmations and messages. Although it’s a step in the right direction, Bray thinks that Guilford County Schools has a lot of work to do in order to alleviate racial tensions — starting with labeling the recent incident a hate crime. black and whites will never get along any better than palestinians and jews. integration did bring the harmony predicted. need to try something bolder and outside the box.